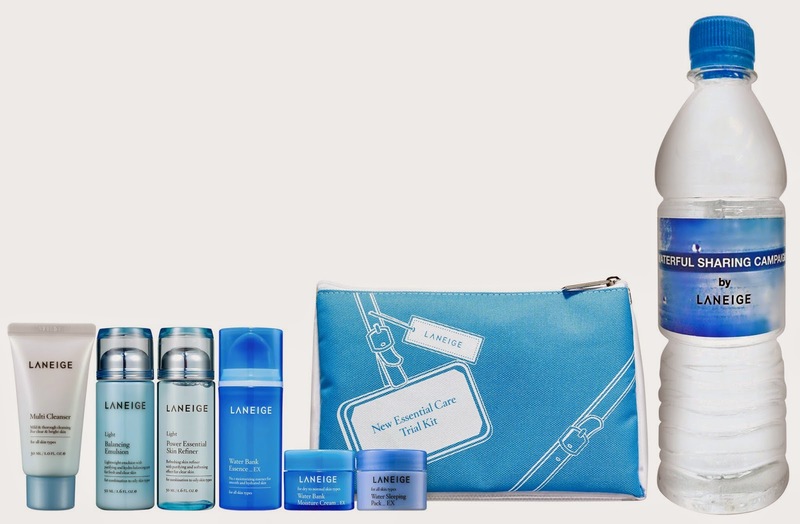 Laneige is a well-known premium Korean beauty brand. They have just launched their NEW Water Bank Launch last Thursday. Laneige has made a great comeback with their breakthrough technology - Biogene technology™. activating our skin's ability to generate and retain moisture. Let's put it in my words, I was born with very dry skin and Laneige Waterbank is my solution, haha. I know right, what pretty decorative placement for the products. "I'm so going to buy the whole range of the products!" The dress code is blue to match with the water element used in Laneige products. Ashley and I were trying very hard to look Korean, haha! Tried to look the drop-dead gorgeous ambassador of Laneige, Song Hye-Kyo. I've been a Laneige user for 3years now. I use their skincare products, cosmetic products like makeup base, foundation, lipstick, lip tint. I'm absolutely loving the new youthful packaging. I tried the new Waterbank on the spot. It's less sticky and it gives me a more enriched moisturizing feeling. Laneige has changed from optimal mineral water to hydro ion mineral water. It contains moisturizing Biogene that activates the moisturizing gene in our skin. Look how translucent and light-weighted the gel cream is. particles that are fully absorbed. Laneige also introduced us to the new Laneige Brightening Sparkling Water range. everyone drinks sparking water, I reckon it's getting popular in South East Asia now. and even promotes the turnover of our dead skin cells. That's what I know about sparkling water. Laneige boasts the amazing benefits of sparking water for tired and dull skin. This Brightening Sparkling Whipping Cleanser is a bubble cleanser. YES, I love bubble cleanser! It removes dead skin cells and delivers essential nutrients. I did a little experiment with this foam cleanser. I squeeze an amount of cleanser on my hand, I named it Thomas, lol. Thomas stayed on my hand until the end of the event and was still standing firm. You can easily judge by looking at the texture of the foam. I often go to events, sometimes events take up the whole day. my make up always melts because of that, then I look extremely dull all the time. I don't know how to explain it in a scientific way but I guess that's about how, haha! Brightening Sparking Water Capsule Mist and Pop Essence can help. Capsule Mist contains highly concentrated carbonation capsules and 47% of sparkling water. Pop Essence helps to increase the brightening effects on the skin. Yes, I had to try it! Very refreshing and it smells really good. Last but not least, Laneige Water Drop Tint!!! Jane hasn't stopped talking about it, she just got one of these at Pavilion the other day. from 30 June to 6 July 2014! As a side note, Laneige has been giving back to the society. It is to raise awareness on water accessibility to communities in need. to raise facilitate the installation of rainwater harvesting systerms in selected homes. This will also help reduce the expenditure on water bills. Laneige Malaysia has pledged to help cleaning and sprucing up the environment whilst the installation take place. Do you know that Malaysians are one of the highest consumers of water per day? We should also pledge to use just enough water and to not waste water. Laneige has come out with "Waterful Charity Kit" where RM10 will be contributed to charity. It's like a trial pack, you get to try these amazing products for a good cause, why not? Thank you Laneige for inviting us to the Laneige NEW Water Bank Launch.